Ah, well. This is another , made from . The fabric has a slight pucker to it, and is ridiculously comfortable. 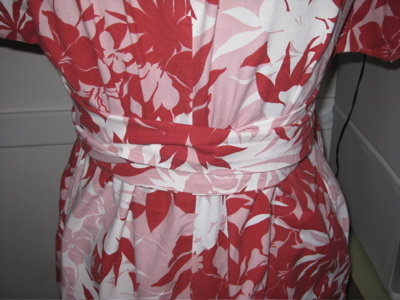 I think the print may be a bit too much of a good thing (if I'd had a red or a pink that matched, I think I would have made the bodice bands and midriff bands in a contrasting fabric) … but again, ridiculously comfortable, and that's what I was going for. I made this (and another one, which I'll show you tomorrow) for my trip to Japan, because I had been told that the humidity in Tokyo was slightly greater than that found at the bottom of the Mariana Trench (and they were right). Tune in tomorrow for another Duro Jr … this time in Amy Butler fabric! Kwiksew has similar pattern in its fall line that looks more wintry somehow. It has set in sleeves and a waist seam also, which I know you lamented the lack of for this pattern. I might make it in lightweight winter fabric. A sweater wouldn’t go over it, but turtlenecks would look really good under it. Butterick 5031 is a Duro that could transition to fall. Plus I love the fabrics suggested: “Lightweight Cotton, Cotton Blends, Challis, Soft Faille, Matted Jersey and Voile”.I wonder what “matted jersey” is? Perhaps regular matte jersey having a bad fiber day? This pattern would look very pretty in wool gauze or wool challis for fall. I’d stay away from that crazy matted jersey though. I am so glad I am not the only one clinging tenaciously to summer dress sewing. Check my blog for my latest – ‘oh crap it is probably too late in the season to actually wear this but I am going to sew it anyway’.So what magazines are inspiring your fall sewing anyway? I think this dress would be great for fall in wool jersey. I’d make it a little longer for wearing with boots, and I’d probably extend the sleeves to the elbow and narrow them at the ends – batwings, no? 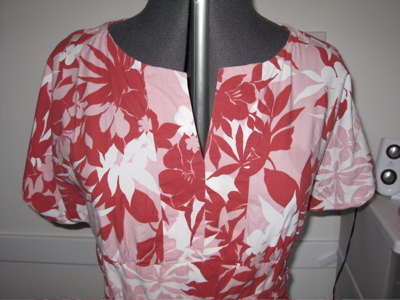 The fun part would be finding the right interfacing or interlining for the neckline . .. .
i love this dress and i think the design on the material and the pattern were perfect for a japan trip — it has a sort of touch of kimono about it, without looking like a slavish imitation. This is beautiful! It looks terribly chic and comfortable to me at the same time. Really a Dress-It-Up-Dress-It-Down dress. Having solid pink or red breaking up the pattern would have taken this aspect away and made it funkier. You could wear pearls with this and not be stodgy. Nice nice extra nice! I love it! Bold, but not loud. Of course, here in NC, I have another 6-8 weeks of 80+ daytime temperatures so I’ve only vaguely thought of fall clothes.It wants a white wrap of some kind — to fend off the over-enthusiastic air conditioning. But I can’t see it with an ordinary jacket or cardigan. A knitted shrug? ??? Pattern is perfect and not at all OTT, don’t be silly. Love this. I LOVE the print! Definitely NOT too much of a good thing – I’m pleased it has no contrast bands. Just gorgeous. Yep! I’ve got the skirt version of this. And it is ridiculously comfortable. Also, my sister sews some pretty deep pockets. I bet I could fit several small kittens in those things. Erin, next skirt you send, pls include kittehs! kthxbai! Wait – did you add a waistband on the back, or is that the “belt” looping around? 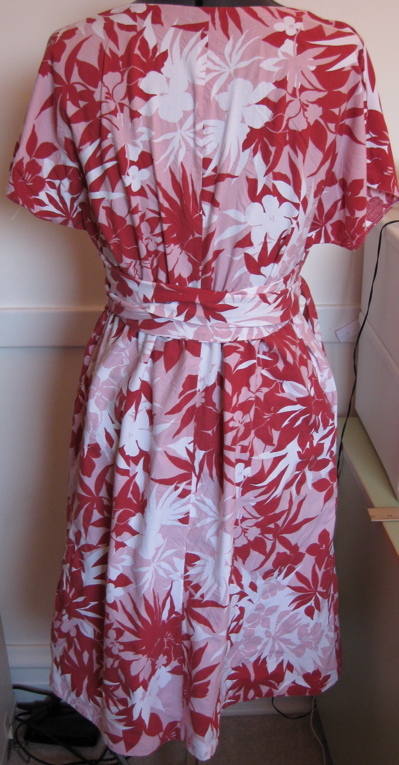 I know the last time you made this dress, you wished the midriff band went all the way around the back. Did you modify the pattern? Carolyn — I didn’t modify it (yet …) it’s just the waist ties looping around. Oh it is so pretty and looks extremely comfy too! A win/win situation for a dress! Can’t wait to see the Amy Butler one! LOVE this one, and can’t wait to see the next if it’s made of Amy Butler fabric! Hooray! I’m a big fan of transitioning my summer dresses into autumn/winter – a cami top or tee underneath, a cardi on top, team it with tights and boots and you’re away!Love the fabric on this one – glad that it finally did arrive. Ok, the final part of my comment refers to the dress above – sorry! You know, I’m thinking with 3/4 length sleeves the duro would look good in a cordaroy! Also, just want to tell you the pic’s of these are great! Hmmmm guess I need to look for the pattern!